Zhi Bo grew up under the shadow of Thomas Jefferson's university and eventually graduated from said university. She is proud to share an alma mater with Tina Fey, and once saw her give a talk about the arts on campus that changed Zhi Bo's life forever. Zhi Bo has completed the WIT curriculum and performs with the indie team, Thunderspike. 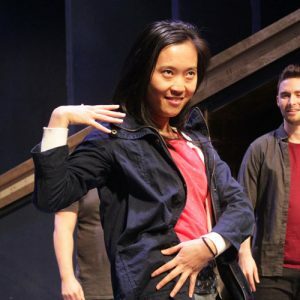 Zhi Bo started taking improv classes after moving to DC because she figured she didn’t know anybody and had nothing to lose by making a fool out of herself in front of a bunch of strangers. Her previous performance experiences included trying out for a role in middle school and getting relegated to being an extra, dancing in ballet recitals, and playing Chopin, Rachmaninoff, et al at piano recitals and competitions. During the day, she works in healthcare consulting. In her spare time, she enjoys hiking, doing pro bono consulting for local non-profits, and watching The Great British Bake-Off. Zeebs, The Notorious ZBD, "Daaaang, Zhi Bo!"